This month, as part of our ongoing Profile Series on solo and small firm lawyers doing interesting things, we’re introducing another category: solo and small firm lawyers who’ve kept their day job but have a gig on the side. Our first solo/small firm side-gigger is Alan Fanger , a lawyer located in Newton, Massachusetts with more than thirty years of litigation experience. Alan’s side-gig is Empower Legal, an on-demand video tool that lawyers can use to prepare clients for legal proceedings, including depositions, trials and mediations. Empower Legal offers lawyers an easy way to familiarize clients with courtroom proceedings. 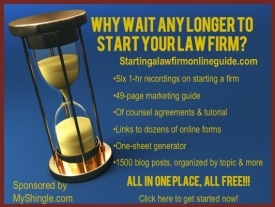 Attorneys can sign up for a subscription which gives them access to a library of videos that they, in turn, can share with lawyers. The plans are affordable and are just a fraction of the billable cost if an attorney were to personally guide clients through each process. The videos are also convenient for clients who can review them from the comfort of their home or office and don’t need to miss time from work to come into the law office to prepare. Fanger created and narrates the video, and it’s evident from the scenarios that he’s chosen and the scripts that Fanger is a seasoned litigator who knows what he’s doing. As I watched the mediation video, I couldn’t help but feel a sense of deja vu having had a similar conversation with my own client and mediator in a mediation that I’d attended just a few days before. That’s another point that distinguishes Fanger’s videos from some of the short freebies available on YouTube: EmpowerLegal videos cover scenarios that many clients don’t often have a chance to witness or that aren’t readily available – like depositions or mediations. EmpowerLegal is not just limited to law firms. Pro se clients can purchase a subscription to prepare themselves for a court proceeding. Law schools are another potential target – and just last month, Vanderbilt Law School has become the first legal academic to EmpowerLegal’s online training for students.